2004 PAPER DOLL CONVENTION - Judy M Johnson, Hollywood Musicals. S&H within the US is 6.00. I do not always know who the original owners were. I try to describe item as best as I can. Antique Paper Dolls The Edwardian Era by Epinal 1975 new, Uncut . Condition is New. Shipped with USPS Media Mail. LENNON SISTERS PAPER DOLLS - ALL UNCUT! She did this for years and years. I have no idea why, as she had no children to leave them to. Not a single one was cut out. There were over 1600 paper doll books that she had collected over the past 50 years. It has 5 pages of clothes including the back cover. See the pics. No local pick up available. Any reflections or shadows are a result of my poor photographic skills!I am not an expert but just a collector for 50 years thinning out the goodies so others can enjoy them! Larger Shirley Temple, Nancy, Sue, Diane, Betty, Dot, ice skaters. We strive to always. The dolls range in size from 6"- 8" and 10". Starting with Lana, she is the 10" doll shown here with her outfits. A few are cut, but most of her outfits are still uncut. Then there are 6 of the 8" tall dolls, each with here own set of outfits including hats, purses, hatboxes and more. Castle Soldiers. Unused condition with cover wear! Inside press out pages in fine condition. I am aware a problem or situation can occur, so I will be happy to work with you. Press-Out Model. Tammy and Her Family Paper Dolls by Whitman vintage book. The book is uncut and appears to be complete. All printed pages are pictured in this ad. There is wear around the edges and corners as pictured but overall the book appears to be in very good condition for its age. Has been stored in a smoke free home for decades. If you have any questions, please ask. BRIDGET BARDOT French Movie Star Paper Doll Set by Marilyn Henry 1971. THIS IS A ORIGINAL UNCUT BOOK. IT IS A HARD COVER BUT NOT DIE CUT BOOK. THE WHOLE BOOK IS SHOWN. 1955 Whitman Publishing Co. old., 1 yr old, 2 yr. BABY GROWS UP Cut Out Dolls. a few pages appear to be missing. We really do appreciate your kind understanding and extended grace. STORYBOOK LAND PAPER DOLLS. JOHNNY, JANEY AND JUDY. 6 PAGES 10 & 1/2" X 12 & 1/2". NEAR MINT CONDITION. Condition is Used. Box shows wear, but clothing tabs are still attached and it appears complete. It consists of eight pages and is complete, uncut and never used. The colors are bright and it is in near mint condition. A slight curl from storage. AVA GARDNER M-G-M Star 1953 #2108:25 Whitman. AS IS, AS ALWAYS. Has wear to covers, corners missing and tearing on corners. All inside paper uncut. Hard to find original set in any condition. THAT GIRL starring Marlo Thomas Paper Doll Book 1967 Saalfield 1379. Each sheet is about 13 ½” long. UGroup of 1990’s Barbie paper dolls, all uncut, good shape. I am clearing out my duplicates. They may have slight wear marks on them, sticker or sticker residue on them from price stickers, each cover is shown in pictures. 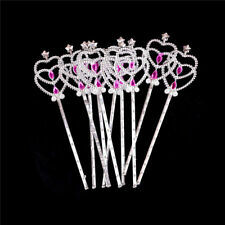 I have lots of these I will be listing, will combine shipping when possible. They can be sent Media mail or Priority. Thanks for looking. Also included is a hard board 1967 Tutti paper doll with her amazing wardrobe. Lots of clothes for the three fashion style dolls. (unless we have a snow storm!). These paper doll books are all from one lady's collection. By Kathryn McMurtry Hunt, illustrations by Lynette C. Ross. 10 full color pages of paper dolls and 11 story pages. Girl Scout uniforms and clothing from 1920's-1940's. 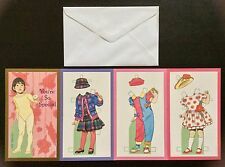 Vintage Paper Geisha Dolls With Umbrellas Standee Placecards. Condition is Used. Shipped with USPS First Class Package. Raggedy Ann and Andy Paper Dolls. A Whitman Book published by Western Publishing 1974. These paper dolls are uncut and in great condition. There is slight wear on cover and a spot on the upper right cover where a sticker was (see detail picture). Not punched out, perfect, never used. Dolls and Clothes are UNCUT … minimal soiling. Tear to edge of clothing sheet. 10 1/4" x (almost) 12" heavy paper (cardboard), illustrated folder, with 2 inside pockets to hold the 2 dolls and the clothes. 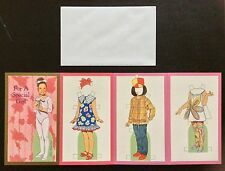 NIB VINTAGE 1965 TAMMY AND PEPPER PAPER DOLLS "SPECIAL WARDROBE"
Vintage Whitman 1976 MALIBU FRANCIE Paper Dolls, Used, Good condition. This set is in very good condition and is autographed by the artist on the inside cover.